Rummy Circle is bringing not one, not two but three online rummy tournaments this Republic Day. The cash prizes you can win from these tournaments is up to Rs.6.6 lakhs denoting the 66th Republic Day of India on 26th January. 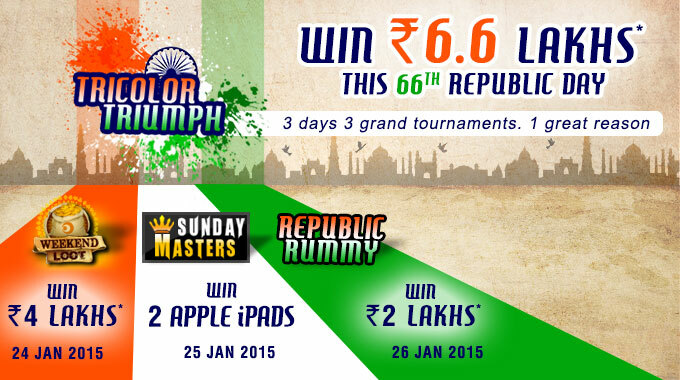 Tricolor yourself this Republic Day by joining the best 3 rummy tournaments with Rummy Circle and start to cash in! The Republic Day special tournaments will get live from Jan 24th 2015 with Weekend Loot Tournament and will close on 26th Jan with Republic Rummy Tournament. The special tournaments are open only for the cash players in Rummy Circle. In order to be a cash player, you need to make at least one deposit and should play a minimum of one cash game before the tournament begins. We wish you a Very Happy Republic Day and may you win lots of real cash on this special day! To know more about Rummy Circle, please visit our Online Rummy Reviews category. Feel free to drop your feedback and suggestions in the comment section below.